I have a crazy reading habit; it gave me a feeling I’m grossly abusing the time if I don’t glance at a para or go over a write -up when I’m caught up with a flying minute to spare during hectic schedules. At such a moment if I hadn’t carried a book or a magazine to flick through, I’m found cursing myself, ‘why I’m so negligent, so forgetful.’ Over the years I got drawn into this retreat of thumbing through books, without them I felt alone, bored and miserable on end. As an English language disciple, I reasoned a minute contains a lot of usefulness as I skimmed a short sentence or fancied a new word, or uncovered its meaning. It’s those fleeting minutes I presumed, are the small baby steps I make to complete my reading treks. And I looked for many such installments of ‘a few minutes’ each morning, noon and night. I started romancing with books when I was ten years, not by reading back then, but by observing my father browsing them spread on his lap. Early mornings and late evenings I found him leafing through heavily bound scientific volumes. 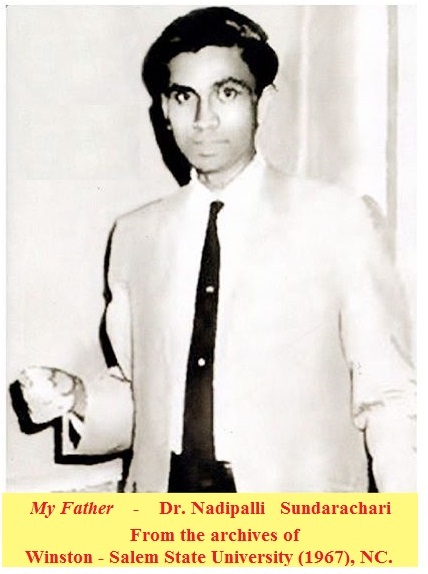 He had done his Doctorate in Physics, after completing the Post-Doctoral research at North Carolina University during years 1964-68, family pressures packed him back to India. Largely my father’s study applied to Physics, Chemistry, and Mathematics. But I never got interested in such serious themes; however, his unwavering habit of enjoying the time he spent with journals – a fixation, what I got attracted and attached from my younger years. It’s in the early years of the 1970s; I remembered his customary practice so distinctly. He wrapped himself in a blanket, huddled on a creaky bed made of a woven network of coir ropes, in an arched posture, his bespectacled eyes following the complex theorems or molecular structures in chemistry or complex formulae of physics. It’s too early then even birds aren’t ruffling from their roosts. His disciplined lifestyle and his thirst for knowledge, how he kept himself updated in his favorite subjects, how he relaxed with books in free time had a permanent imprint of my father and his abiding aspect of reading. This gift – an attitude I acquired as lifetime insurance and a legacy awarded by my father. It had been thirty years since he died but his fondness for books I still carried as an emotional memento which had mounted me as a well-brought-up personality I’m today. I got my second blessing relating to reading solemnized at one of my friend’s house. The friend now a well-known doctor had settled in the US. His father enjoyed two passions; one for English literature and the other for cigarettes. At age twelve, both his hobbies fascinated me like was there an interlinked factor that connected reading and smoking. The rich leather bounded books looked as if carrying a pious aura of its own as he placed them before him and a pencil in his hand to underline the important paragraphs and difficult words. In the evenings soon after he returned from office, I admiringly recall even today, his relaxed frame, and a book in hand and a pencil to mark the interesting sentences. It was one abiding, resourceful trait I had borrowed from him. You may find me not having a wallet, but I wouldn’t go out without a book in hand and pencil in the shirt pocket. Thus at an early age, my appetite for English literary works took an hungered pitch. I picked most of the books that kept stacked in my library from second-hand bookstalls in the alleys of Delhi, Calcutta, Chennai, and rummaged from the heaps of homeless books displayed on the payments of Bangalore and Hyderabad. Ever since the bookshelves bowed and grew so heavy with ideas and words, I too got lost in the great reading sessions; apprised and matured in the paradise of fiction – imagination and intellectuality and perception. Forty years later down the road, they have so sensibly overwhelmed me, and braced me with a culture to live by, and held out a clue to a successful and peaceful life. Reading had always salvaged me from prejudicial events in life, and certain dark experiences. In such instances, the hidden radiance of books showed me the comfortable corners to look for trust and hope. I handpicked my selection that suited my taste – fiction or non-fiction: got so enchanted choosing historic, romantic, biographical genres. Later I also allotted one complete bookshelf to new age English writers in India – the country where I was born and doing well. I most delighted in themes about human relations, emotions and language and nuances implied in expressing them. When I sit down with a book, I believed it was waiting to nourish me with appetizing thoughts, and I loved marking and maneuvering with words, and syntax. As soon I entered college; enlarging my word-stock had become an acquiring part of four years of my hostel life. I became so obsessed with English novels, word-power books that I narrowly escaped a disastrous failure in graduation. It had become evident, after graduation, at one stage, my hunt for eloquent words, descriptive words, word forms, derivatives, phrases, idioms, word building, word-using had driven me to fanatical heights. When I’m in the late thirties, I had gotten involved in school administration – my family enterprise. It’s my love for teaching, especially the adolescents had called forth in choosing editions related to parental and child issues, and the whole range of self-help books – emotional intelligence, self-esteem, personal relationships and the whole gamut of self-help and well-being literature. I truly got enriched with evergreen life lessons and timeless wisdom. As I entered mid-forties, I smelled the menu of life’s bittersweet experiences. I’m forced to stop to look at misgivings in my face that led me to select the ‘coming of age’ novels. I could drink in from those narratives the essence and travails of a wide range of experiences. I could draw out allusions of strong portrayal and evolution of characters from childhood to adulthood beating all odds of trials and challenges. I favored them perhaps for one reason that deep down I could connect with the impactful representation and the struggles of a protagonist. While reading them, it has induced an impression, a guess, an odd feeling that the writer might have abbreviated my personal experiences and stitched them together into a narration of emotive words and expressions. I considered my reading habit as ‘deep reading’ with a purpose and focused which I could define owning the enormous values and virtues; thus I have gained. Each novel I selected would strike like a bold new friend sitting across and talking with all his geniality willing to share some with me. Some writings have helped to gain an understanding of an approach and mindset of people within my circle of near and dear. Another set of the books had the recipe for gaining a strong grasp to empathize with feelings and thoughts of family relationships. It’s something close to that the books I read were like the spectacles I wore to see the good in others and the benefit I could derive from them. 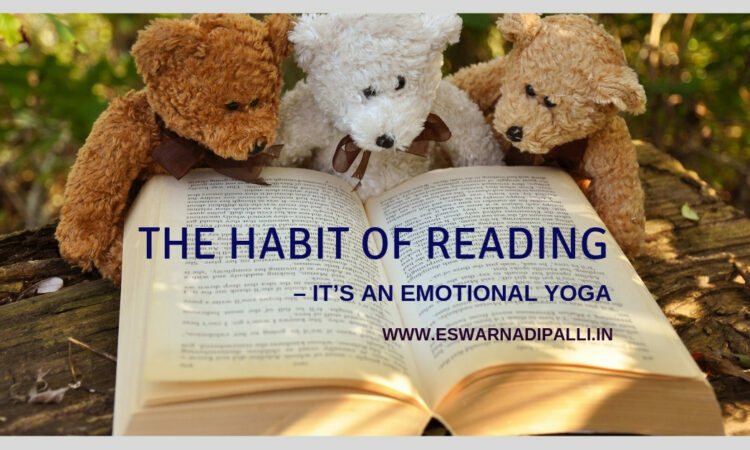 The daily affair of reading has emotionally configured me to become the person I’m today and gained a worldly sense of myself in my life’s journey. It amazed me at how the references in the books I have read over the years had helped to discover the soul of my affable character. I’m a stickler of time. I maintained a rule to carry a book whenever I’m out on an assignment. Given to waiting I swiftly open a book to read a paragraph, or enjoyed a couple of new words: I would wisely squeeze out a tiny slice of value from a few minutes of waiting. For years, the unanticipated waiting time presented me bountiful chances to browse through hundreds of paperbacks. The secret of ‘celebrating reading,’ spelled out, I self-consciously hoarded and engaged the minutes – hundreds of them in any day and the wrapping up of bulky novels took care of themselves. I carved up my tradition; I laid out a pragmatic culture on, “how I ‘time manage’ my habit of reading in an available instant – every minute used sacredly.” I have adhered to this purpose – rejoicing – a book in hand. I handled well the luxury of plentiful time, and I applied it in reading worthy books and rewards are quite outstanding. I’m gifted with freedom, awareness, and a mind that truly cares about me, my family and others. And the confidence I can attack any problem thrown at me and come out unruffled and undisturbed. It has nothing to do with money; it’s a matter of strong-mindedness, which makes my goal in life – reading – a worthy road taken.